Knights of Creativity Spirit & Ale: Yes, you too can have abs of ale. October is traditionally the time of year when everyone in my family starts putting together their Christmas Shopping Lists. Here is an item that I'm debating on putting on my list. Do you think Santa has been using one of these all these years? I bet the mall Santas have! "The hilarious yet genius Beerbelly is a beer caddy that you'll hold near and dear, since you wear it under your shirt for covert consumption at bar-b-ques with the in-laws, sporting events, parades, political rallies, weddings -- just about anywhere a nice cold one would compliment the occasion. 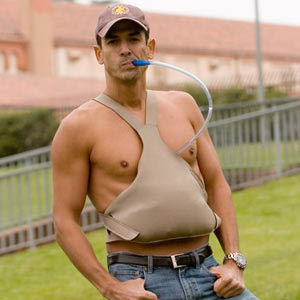 The Beerbelly is a fake beer belly: a beer "bladder" that fits stealthily and comfortably around your waist and features a feeder tube to bring the brew to papa. Say adios to $10 beers at the game and hello to the beer belly you've always aspired to achieve. Not just for beer, Mama's margaritas and Aunt Bessie's bug juice chill nicely in the Beerbelly as well. You can even use it as the hydration pack it is and fill it with some good old-fashioned H2O. Nahhh! Quality-designed and built, the polyurethane bag on this fake gut holds up to 80 oz. (ironically, more than a six-pack, go figure) and nestles in a neoprene insulated sling that becomes a literal beer gut, keeping your beverage of choice chilled for hours! Also included with the Beerbelly is the specially designed Pleasure Extender Ice Pack, which fits in the sling to keep your brew cold for hours! Made using "Stay Soft Gel" with a nylon taffeta exterior, it can also be heated up for hot beverages or used alone hot or cold for therapy. (A cold compress for the morning after, perhaps?)" No, I don't think that I'll put it on my list; however, I will file this under, "Why didn't I think of that?" Actually, the Beerbelly is just a modified form of the US Army water bladder that all foot soldiers carry in their combat packs for hydration. Sir Ryan has shown me how his works. Just another example of how war and economy breed innovation!